My Dad made a simple version of this. He only used fresh coconut, ground it himself, sugar, caned manderine oranges and fresh cut navel oranges. layered in the "Ambrosia Dish" (only thing that dish was used for once a year at Christmas) with sugar and the coconut milk from the fresh coconut. This one looks great though. Fresh coconut is too much trouble. Do you think it would taste the same or as good if I used homemade whipped cream (it's all I ever eat) & substituted greek yogurt for the sour cream? Actually, I'm going to try that out this weekend! Ambrosia is a simple and delicious dessert with many variations. We usually substitute small curd cottage cheese for the sour cream, as it adds texture, but I've also had it with cream cheese or plain Greek yogurt. 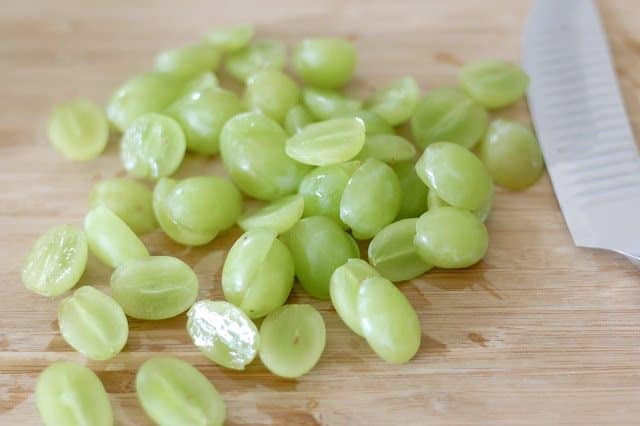 We add any fresh fruits we have on hand and supplement with canned fruits as needed. You can add a box of any flavor jello for flavoring if you like. 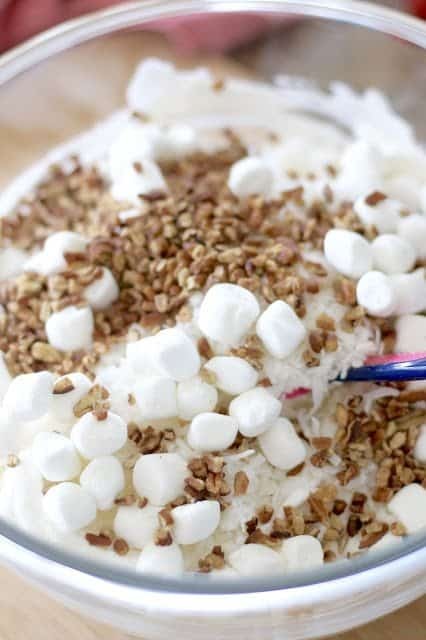 Chopped pecans, mini marshmallows and coconut add flavor and texture if you like them. Chopped apples hold up well in this fruit salad. If adding fresh strawberries or bananas, you probably want to eat it within a couple of days. Grapes (I prefer red) and either mandarin oranges or clementines are a must. Here in the south, just about anything goes. Enjoy! I created a diabetic version of this for my husband who loves sweets. I use a box of White Chocolate instant pudding and mix it with enough water to loosen the mix…about a cup. Then I wisk in 8 oz. sour cream and wisk til smooth. Fold in 8 oz. cool whip and a can of mandarin oranges drained and a can of well-drained fruit cocktail packed in juice. I add pecans for texture and he loves it. I substitute fresh fruit if I have it on hand. Is it still ambrosia if you skip the marshmallows? Had to double take the jello for flavouring post as I'd forgotten that jello is powdered in America. 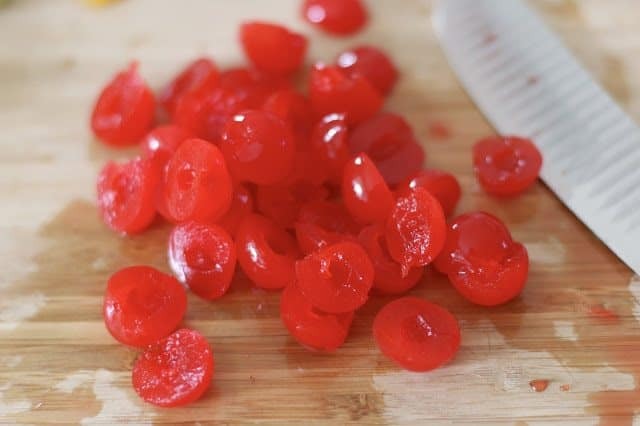 Here, in Britain, it comes in a slab of already made up dense jelly (fun to eat like soft gumis) which is melted in boiling water (sucking up melting pieces is fun too, like eating hot boiled sweets/hard candy)diluted and poured into a mould. Oh I could put chopped up into marshmallow sized bits jelly, hmmmm. Just wondering though. Is no sugar fruit an American thing I have missed? 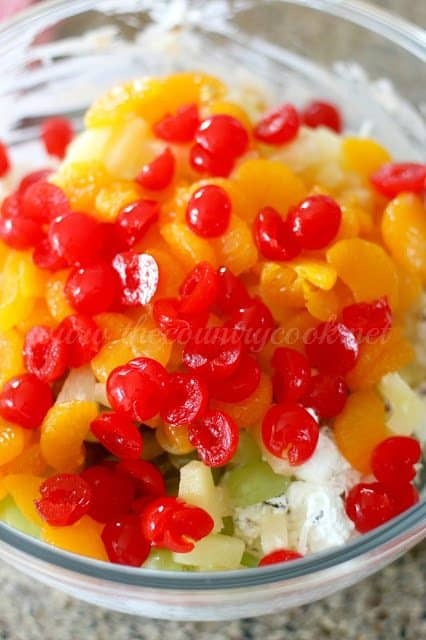 my mom used to make ambrosia all the time at Christmas, but she used peeled oranges, bananas, apples and cherries, layered then she would put coconut all over the top and sprinkled lots of sugar on top and then cherries on top. My brother and I always called it embroidery instead of ambrosia. I love my mom's but I think I would also like this. 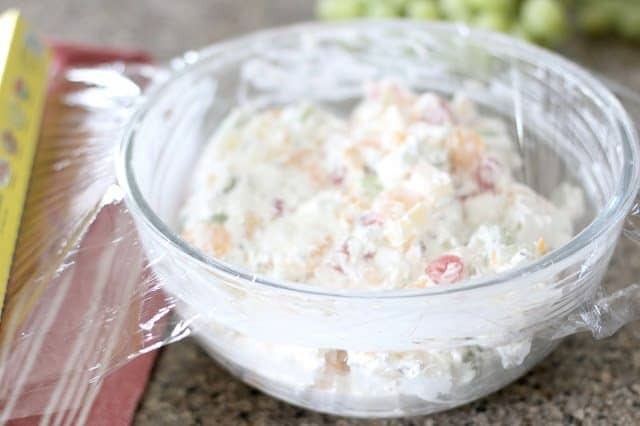 This is similar to watergate salad which I also love. I will certainly try this. Thanks. I was given this recipe as a bride 50 years ago. However, the one I use is named 5 Cup Fruit Salad and only has five ingredients. 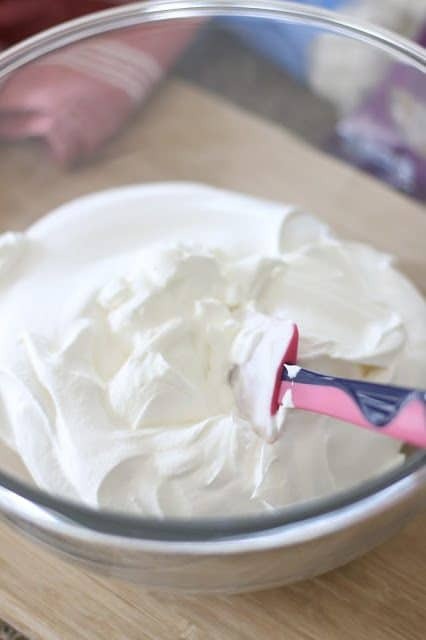 It does not have the cool whip…….but then, Cool Whip was not around that long ago…..LOL. Just made this for our small group and church and it was really good! A big hit! Most recipes I've tried from Pinterest have gone in the garbage but this one is going in the recipe box! Thanks! So refreshing and good. Thanks! Pinned it! I love it, but people I make it for doesn't like coconut in it…..and I am beginning to dislike it too, seems the more you chew, the bigger the coconut gets and it never goes away 🙂 I used to eat MOUNDS candy bars and love them, so I bought some the other day, and same thing with the coconut…..you could not chew it up enough,I've heard others say the same thing….could it be the coconut ? Does anyone know…..I think I used to buy CHOPPED coconut, but all I see now is SHREDDED…..that may be the problem…..or may have to buy a fresh coconut…..any ideas here? 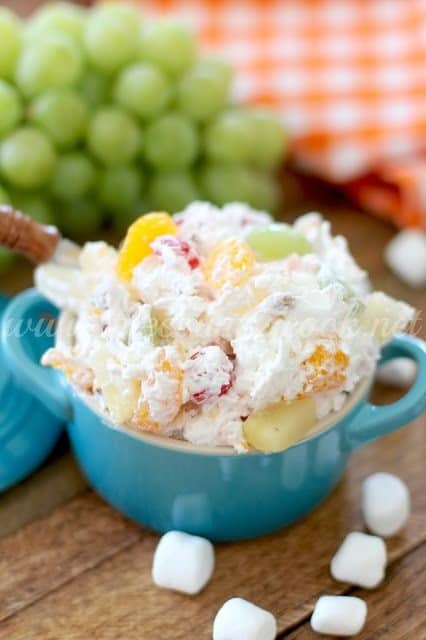 I have been making this Ambrosia salad for years but we don't use cool whip in ours, My family looks for it every year at Thanksgiving and we use fruit cocktail. we just love it. 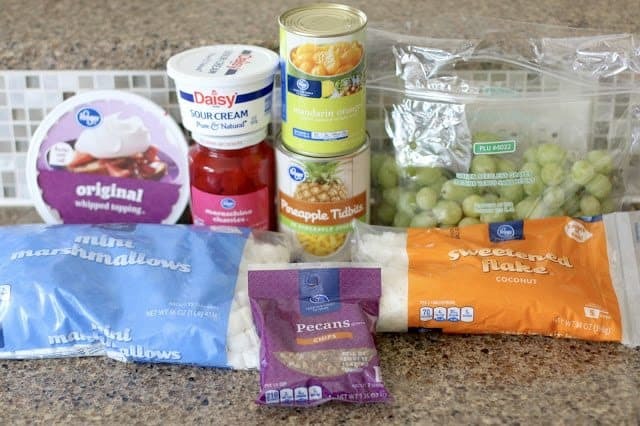 I usually put marshmallows–(I like to use fruity pastel colored), coconut and sour cream in bowl over night. 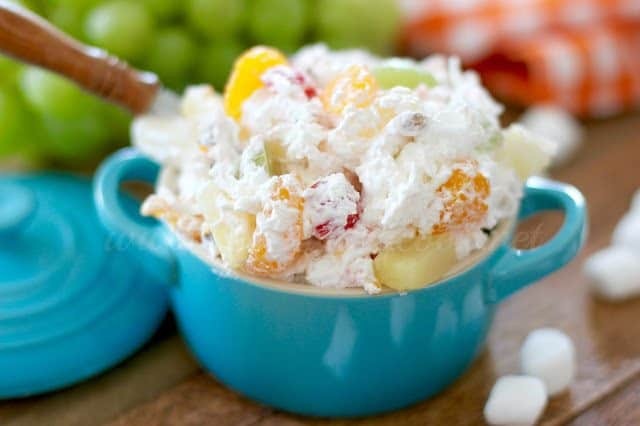 The next day, I add pineapple, fresh cut apple pieces, grapes, diced peaches-(drained), mandarin oranges, fresh diced pears, diced apricots(drained) and sliced bananas along with a small tub of cool whip, I accent with red maraschino cherries. Oh, yum! It doesn't last long, that's for sure! Thank you for posting up this recipe. My mom made this growing up, and I never really knew what she put in it. Not many references for it online either. I use the flavored mini marshmallows and use drained crushed pineapple instead of the bits. For some reason, using the flavored marshmallows cut the sweetness and more people enjoy it! My husband's 103-year old grandmother always makes a big bowl of "rice" for Christmas. He just loves it! She dotes on him and he adores her. The recipe includes white rice, Cool Whip, fruit cocktail, marshmallow fluff, and sometimes, pecans. It is very airy and easy to eat. I don't want to know how many calories are in a portion! 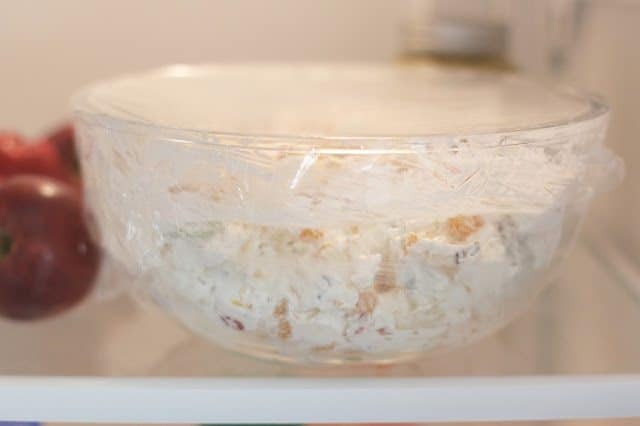 I love your blog,whenever i'm looking for a recipe i go straight to your blog.You make recipes simple and easy and i like that.I'm making your ambrosia salad for Xmas dinner.Merry,Merry Xmas to you and your family and please,please never stop with your posts. Hey there Amy, you sure did make my day! 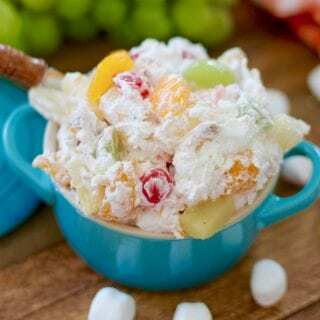 Hope you had a wonderful Christmas and everyone enjoyed the Ambrosia Salad. Will it still be just as good if I leave the sour cream out? I like sliced banana in mine. 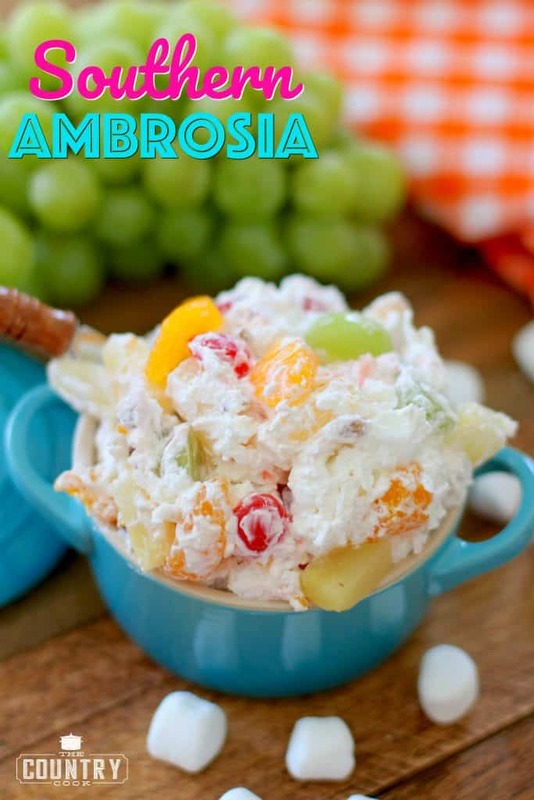 I love Ambrosia salad. My mother used to make this as a treat for us when we were young and boy did we love it. I think she used fruit cocktail. A rather cheap treat back in the day. I had a hankering for some last year and nobody could remember how she made it. Thank you for the recipe. Thank you for sharing your special memory with me! I hope it brings back some good memories for you Susan!